In 1967 Matra replaced it’s René Bonnet inspired Djet model with the 530 an all new mid engined 2+2 deigned by Philippe Guédon who had previously worked for Simca. Conceived as the car for buddies, Voiture Des Copains, the 2+2 with pop up lights and a targa top was powered by a German sourced 70hp V4 Ford accessed by through the rear window. While the engines and drive train were built in Germany the steel back bone chassis were built by Carrier in Alençon, Normandy and assembly was completed 150 miles away by French coach builder Brissonneau et Lotz at Creil in Picardy. In 1969 the 530 was upgraded with the engine now producing 75hp and a deal was done with Chrysler Europe to distribute the Ford powered cars through their Simca network from 1970 and to work on a joint replacement. Production of all but the motor and drive train for the 530 was also brought together under the single roof of the Matra Automobiles facility at Romorantin in the Loire Valley around this time. Giovanni Michelotti was responsible for minor styling upgrades to the 530 which became the 530LX in 1970 these included replacing the acrylic glass removable rear window with a glass hatch held open with gas struts and the removal of a nudge bar from the front bumper. 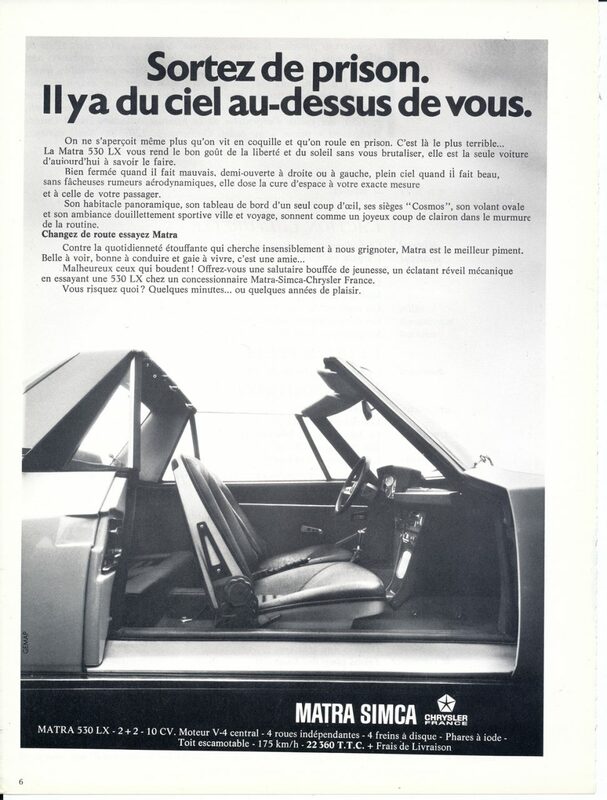 These 530LX ads found in the French journal “Connaissance des arts” date from March and May 1971 respectively five months before the introduction of the budget black bumper, orange or white only 530SX which had the targa top and pop up headlights deleted. The under powered 530’s competitors included the Lotus Elan +2 and Porsche 912 which were both more expensive and the cheaper MG B GT. 9,609 530s, 2,062 530As, 4,731 530LXs and 1,146 530SX’s were built by the time production ceased in 1973. 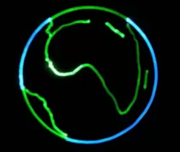 Thanks for joining me on this “Voiture Des Copains” edition of “Gettin’ a li’l psycho on tyres” I hope you will join me again tomorrow. Don’t forget to come back now ! 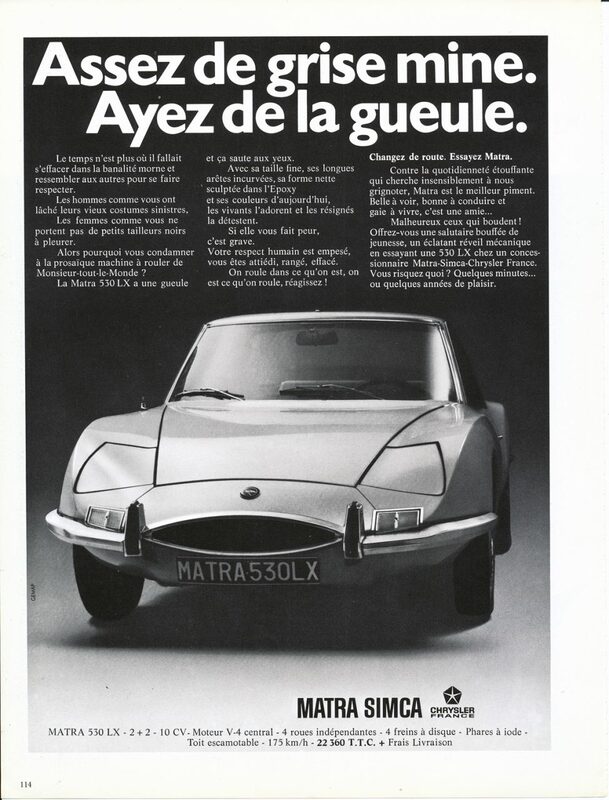 This entry was posted in Uncategorized and tagged 530LX, arts, Brissonneau et Lotz, Carrier, Chrsyler, Colmar, Connaissance, des, Europe, Ford, Guédon, Matra, Michelotti, Psychoontyres, Ralph, Simca on November 10, 2015 by Ralph.